The game of Baccarat is of French origin where the spelling is 'Baccara' - English speaking countries added the 't' for no good reason that can be surmised. Despite what you might read on other websites, the game is a relatively recent addition to the realm of card games and most likely appeared in the 1800s. Baccarat soon became extremely popular in nineteenth century France, maintaining for some reason a reputation of high stakes and 'class' which still lingers today in Casinos around all parts of the globe. 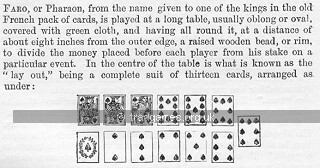 No book that this author has unearthed on the subject gives a definitive answer as to how and why it was invented but the general consensus is that Baccarat is a simply a child of the family of games that include Blackjack, Pontoon, Vingt-et-un and is perhaps the direct ancestor of earlier games such as Basset and Faro. Whereas most animals and games evolve into more complex and forms over time, Baccarat does not follow the typical pattern at all. In fact, Baccarat is so simple that were the element of gambling not present with the adrenalin-induced highs of winning and the visceral sweaty fear of losing, the game would be an extremely tedious one indeed. Most children over 5 would dismiss it as very boring after a few minutes. Shown to the right is a beautiful Baccarat pallette used for dealing, collecting and flipping the cards over. The first mention of Baccarat in the English language is from the Daily Telegraph of 13 January 1866 and the game quickly became popular in England and the USA after that time. The notion of Baccarat being a high-class game continued and when Ian Fleming wrote the first James Bond book, Casino Royale in 1953, the entire plot is based around an extremely high-stakes game of Baccarat. Bond plays Baccarat regularly and there is no doubt (in the books at least) that he is from the upper echelons of society. The villain of the piece, 'Le Chiffre' chooses Baccarat however, because the stakes get high very quickly and he needs to raise money in a hurry. At the start of the 21st century, the film of Casino Royale replaced Baccarat with Texas Hold'em Poker - a sign of the times if ever there was one. Some books and websites assert that Baccara came to France from Italy in the fifteenth century. This is misleading and probably what they mean is that the game of Basset came from Italy to France in the fifteenth century. Basset is a banking game that was played as follows. 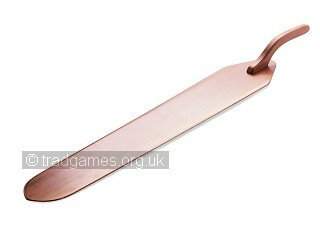 Each player is dealt 13 cards face up and on each he can place a stake. The banker then deals cards face up alternately to two piles in front of him. To start, the banker deals a single card and wins the stakes placed on any cards of the same value. The banker then deals cards in pairs - for the first card of the pair dealt, the banker wins the stakes placed on any cards of the same value but for the second card of the pair, the player wins the value of the stake if the value matches. The dealer continues dealing pairs until all stakes are gone. This is fairly simple stuff but the sting in the tail is that when a player wins a stake, instead of taking the money, he can instead leave the stake there and if he wins a second time, the bank must pay seven times the value of the stake. This can be repeated with the winnings rising to 15, 30 and 60 times the value of the initial stake. To the greedy, the temptation to leave the stake there must have been pressing but, as is clear after a moments thought, the chances of winning at those high odds diminishes drastically - and therein lies the loss of many a fortune and the appalling reputation that Basset came to have. Richard Seymour in his improved version of the 'Compleat Gamester' in 1725 said "the dimmest eye may easily see, without a pair of spectacles, how much and considerable the design of this court game is in the favour of the Banker". Basset eventually was replaced by its descendent 'Faro' which was similar but added some new rules such as the ability to bet for or against a particular rank appearing and half the stake going to the bank when the bank dealt a pair of cards of the same value. By the nineteenth century, Faro was the world's most popular Casino game but by 1900 it had been replaced by Blackjack and Baccara. Each hand starts with 2 cards and a third may optionally be dealt. The values are summed with court cards counting as zero and the nearest to 9 wins. Where the sum goes beyond 9, the value returns to 0 instead of going to 10 e.g. 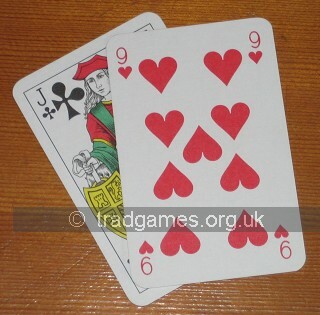 A pair of cards 6 and 7 has a value of 3, not 13 and three cards 9, 6 and 9 have a value of 4. Just ignore the leading digit where the sum is 2 digits. Shown to the right is a perfect score. 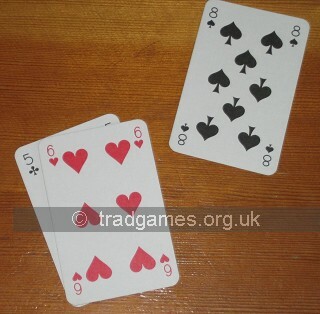 The player was dealt a 5 and 6 giving a score of 1 so a third card was requested and luckily it was 8 making a score of 9. This would usually win the round. Yes, it's that simple. The complexity lies only with the more trivial aspects of the game - the nomenclature, the etiquette, the rules for betting and the order of play etc. The rules of the house usually make the game even more simplistic because most house rules generally require both player and banker to play the odds. The player's only freedom of choice is normally whether or not to ask for a third card when the sum is 5. This game is known in England as "Baccara Banque" or just "Baccara" and in France as "Baccara a deux tableaux" - Baccara with two tables. It isn't usually played in the USA. 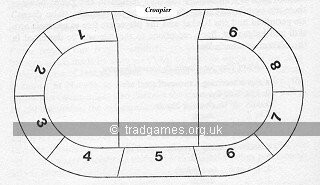 The rules were described by Seymour in an 1897 Hoyle and were definitive at the time although different Casinos will have different house variations of the rules. The reason for the name is that the non-banking players are split into two halves - one half being the players to the right of the banker and the others those to the left. For each deal a representative is chosen from each half to play against the banker. 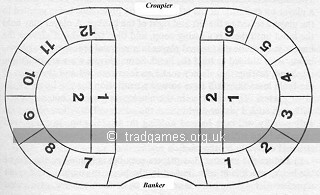 To begin with these are the players either side of the banker but when a player loses, the privilege passes to the next player along and so on until all on that side of the table have played and the representative duties return to the player next to the banker again. Players usually bid to decide who is going to provide the bank and the bank is held for the duration of the cards in the shoe or until the banker chooses to relinquish it (whether due to bankruptcy or otherwise). To start, the banker places the amount to be played for on the table and each player in turn has the right to say 'Banco', and thus challenge the banker to play one-on-one for everything he has staked in one go. To the left is shown the table for Baccarat with two tables. The central betting areas allow spectators to place a bet. If there is no Banco, each side of the table contributes stakes to the amount of the banker's stake and the banker then deals two cards to himself, and to the two representatives. If any of the banker or players have a total of 8 or 9, it must be shown at once and the two other hands are also then shown and bets are paid accordingly. Otherwise, each of the three is given a chance to take a third class face down starting with the player to the banker's right and ending with the banker. If neither player accepts a third card, then the banker must take a third card. Any third card is dealt face up and then all hands are shown and bets paid accordingly. If player and bank have the same total, it is a stand-off and no money is exchanged. This version of Baccarat differs in two main ways to that of Baccarat a deaux tableaux. Firstly, for each deal unless someone goes 'Banco', the banker plays only against the player to the banker's right and the banker pays or is paid by all the players. Secondly, the bank changes hands much more regularly when the dealer loses a coup, passing to the player on the banker's left. To the left is shown the perfect Baccarat hand. This is unbeatable.. The game is very similar in play and again the main difference surrounds the bank which in this version is always held by the house or casino. Each deal pits the banker's hand against the player's hand - and players simply decide whether to bet on one or the other. The person who bets the most for the player's hand gets dealt the cards and plays them but from a betting point of view this person is no different to any of the other players who bet on the player's hand. The shoe of cards does still pass from player to player but this person is strictly a dealer only and doesn't bankroll the betting. The dealer is otherwise no different to any of the other players and may bet on either the player's hand or the dealer's hand, too. Baccarat is not the hugely popular game that it once and so information sites on the Internet are not prevalent. However, it is still a high-rolling casino game and so there are plenty of casino websites on the Internet that allow Baccarat to be played on-line. Master the game of baccarat at ThePOGG with their game guide. Learn about baccarat house edge and RTP values and get strategies and learn optimal play for this casino game.